Great Kundalini Yoga Class Video…. I did this 30 minute Kundalini Yoga video this morning and feel revitalised and refreshed. It’s excellent for beginners and anyone can take part…. Yogi Bhajan was a wonderful Sikh man who worked tirelessly to spread the message of not only Sikhism, but also peace and love. Many people all over the world follow his teachings through his foundation 3hO – Healthy, Happy, Holy Organisation. He was a clear cut man who as they say – would shoot from the hip. The last line from below will confirm this! Affirmation for Self Love Sit straight. Place your right hand on your heart and say, “My heart, I love you.” Place your hands on your eyes and say, “My eyes, I love you.” Then on the top of your head and say, “My head, I love you.” And next, at the navel point and say, “I love you.” And lastly on both your knees, and say, “I love you.” If you pay a little bit of attention to yourself and show love to yourself you will find yourself different. You have been taught to hate everything, and that what you do not hate will eat you up. This is your most stupid behavior. 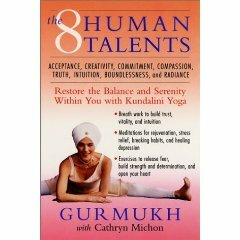 Whilst we are on the subject of Gurmukh Kaur Khalsa, I thought I would write a post about her book – 8 Human Talents. Now I don’t say this lightly but this book is one of those that gives you the tools to achieve pure physical, mental and spiritual stability – if you put what she says into practice and continue to do so. The 8 human talents are a deep explanation and analysis of each of our 8 chakras. Each Chakra is summerised as the following descriptive word – Acceptance, Creativity, Commitment, Compassion, Truth, Intuition, Boundlessness and finally Radiance. What is the difference between Kundalini and Hatha yoga? I picked it up and read it about 7 years ago but really need to read it again. I’m staying with my Mum at the moment as she isn’t very well but as soon as I get home, I will pick this up again. 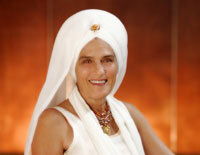 I was looking at her site yesterday and felt a compelling desire to learn what Gurmukh has to teach. Yoga For All Of You Beautifully Pregnant Woman Out There…. Her message is to be empowered and be in control during and after your pregnancy. I have personally always thought that women should give birth on all fours like many animals do in the animal kingdom as that is where your strength is. When you are lying down on your back, you have no strength. I don’t have any children yet so I guess I can’t really comment. Take a look at Gurmukh’s website. There are pregnancy books and DVD’s available. If you are lucky enough to be near on of her centres, go and take up some classes. She also does a weekly message on her site which is great and always full of positive messages and information.